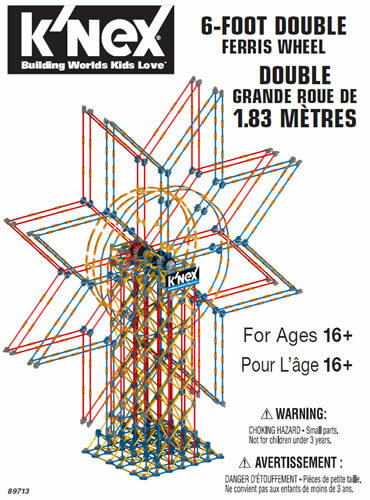 The Kid K'NEX parts below have now been discontinued. Please note that Kid K'NEX parts are much larger than classic K'NEX parts. Above quantities may vary slightly. Total weight at least 300g (0.65lb). 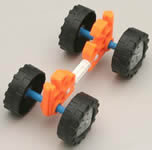 As used in the K'NEX Models that Move set. Colours may vary - red or blue. 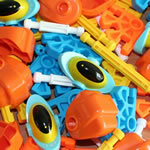 Kid K'NEX Dorsal fin blue/green and orange (as used in Kid K'NEX Creatures set). 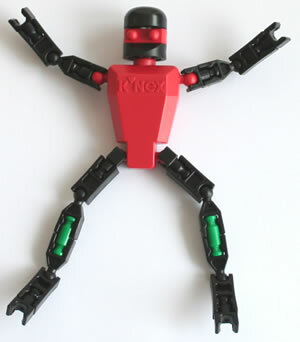 As used in the Kid K'NEX Stretchin' Friends set. Kid K'NEX Tortoise shell. Colours may vary. Fits onto the end of any Kid K'NEX rod. Colours may vary. 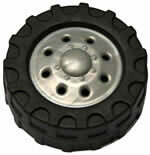 See Sally Snail and friends for some examples of this wheel in use. Fits onto the end of any Kid K'NEX rod. May have a white line painted on front, similar to the one in the photo. 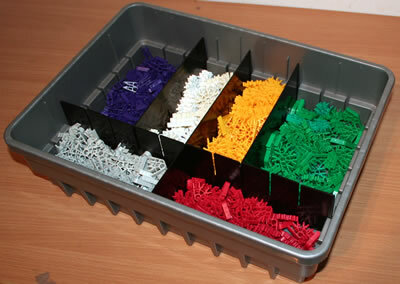 An ideal small Kid K'NEX kit for the home, nurseries, primary schools, clubs and family learning. The kit consists of a bag containing the parts needed to build the "Billy Whizz" model shown in the photo. Attached to the bag is a label showing how to assemble the model. Pack of 120 Kid K'NEX Connector 8-way Red. Weight 1.9Kg (4.2lb). Pack of 190 Kid K'NEX Connector 4-way Blue. Weight 1.9Kg (4.2lb). Pack of 230 Kid K'NEX Connector 3-way Orange. Weight 1.9Kg (4.2lb). Pack of 520 Kid K'NEX Rod 92mm Yellow. Weight 1.9Kg (4.2lb).